GunsAmerica just released a detailed review of the recently-upgraded Kestrel 5700 Elite with LiNK, a software-enabled weather meter. If you compete in practical/tactical events (with targets at multiple distances), or campaign a wide selection of rifles, or shoot at Extreme Long Range, you may want to get this device. It offers unrivaled capabilities in a small package. This impressive handheld device combines weather-monitoring capabilities with a full-featured, very sophisticated ballistics solver that now calculates out to 5,500 yards. Using Bluetooth and LiNK technology it communicates with your mobile device as well as LiNK-enabled laser rangefinders. — The Device can hold up to 30 different rifle/cartridge profiles, each with its own BC and muzzle velocity for ballistic calculations. — The Device registers current windspeed, wind direction, air temp and pressure, and other variables, and then sends that info via Bluetooth to your smart-phone, updating the ballistic solution. It essentially updates your drop chart in real time. — The Device “talks” to your smart-phone, providing a large, convenient display that can show both elevation clicks and wind corrections. The display essentially replaces your data card. The Smartphone integration also makes it easy to modify your different rifle/ammo profiles. “I think the best testament to the capabilities of the Kestrel 5700 Elite were on display at a recent range trip where I was getting my modified Ruger 10/22 ready for an upcoming precision rimfire match. I started out with a sort of hodgepodge of information, using an unconfirmed BC [for Eley Force ammo] that I’d heard from a friend along with a muzzle velocity that another friend had gotten with the same ammo. I created a new profile using this assortment of data and entered in target distances for 200 and 300 yards. Imagine the smile on my face then when I got hits at both distances with the elevation setting only being 0.2 mils off at the farthest target. 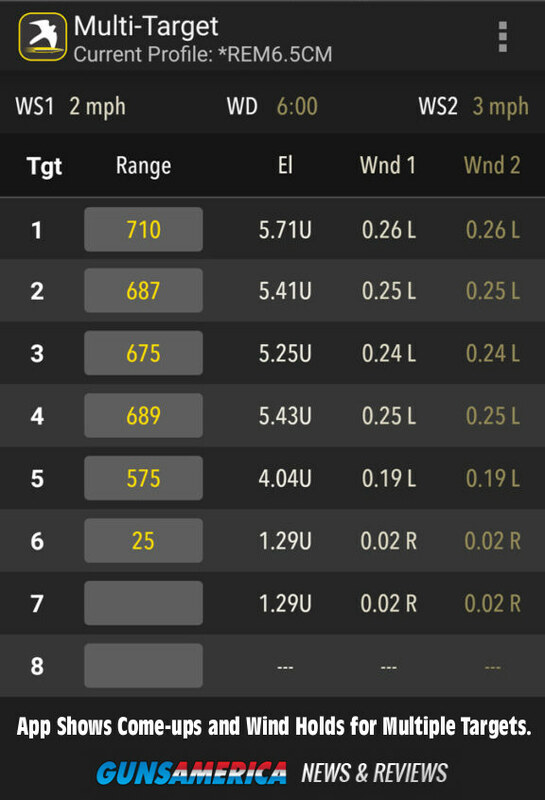 The LiNK Ballistics App lets you set up multiple targets for single-screen viewing. 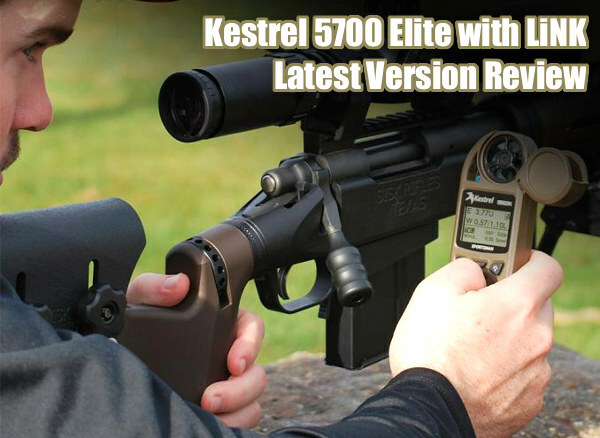 The Kestrel 5700 Elite can also be wirelessly paired with LiNK-compatible laser rangefinders. Being able to instantly accees exact target range data allows a more rapid and and more precise ballistic solution. In addition to the ballistics solver capabilities, the Kestrel 5700 Elite is a comprehensive weather meter that monitors all key variables including: wind speed and direction, temperature, humidity, heat index, pressure, and altitude. Your data log can be transferred to a iOS/Android device wirelessly with the LiNK wireless communication option and Kestrel LiNK app. The 5700 Elite now uses a single AA Battery housed separately from the circuit board. 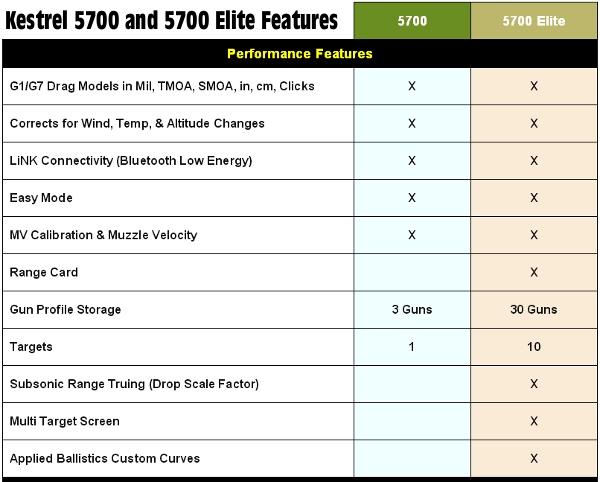 Share the post "Kestrel 5700 Elite Offers Ballistic Solutions for Multiple Targets"
S&W Model 617 now has a 10-round cylinder, but early models were six-shooters. While Accurateshooter.com concentrates on high-accuracy rifles, we know that many of our readers enjoy handguns. We are often asked “What is your favorite handgun — Glock? HK? SIG Sauer?” The answer to that question may be surprising. This Editor’s favorite handgun, at least the one that gets shot most often, is a rimfire revolver — that’s right, a wheelgun. This Editor’s first really accurate handgun was a .22 LR Smith & Wesson Model 617 that could easily stack ten shots in a dime at 10 yards. It remains my favorite and most-used handgun. What can we say about the Model 617? The single-action trigger pull is superb, and the accuracy surpasses most any semi-auto rimfire pistol, except for a few, very expensive target pistols. We like the 6″ version for the longer site radius, but the 4″-barrel 617 is also very accurate, and it balances better. We strongly recommend that new pistol shooters start off with a .22 LR rimfire handgun. The .22 LR cartridge is accurate but has very low recoil, less “bark” than a centerfire, and very little smoke and muzzle flash. New shooters won’t have to fight muzzle flip, and won’t develop a flinch from the sharp recoil and muzzle blast common to larger calibers. With the .22 LR, the trainee can focus on sight alignment, breathing, and trigger pull. Here are three video reviews of the Smith & Wesson Model 617, both 4″-barrel and 6″-barrel versions. All three videos demonstrate the 617’s great accuracy. The reviewers concede that this handgun is pretty expensive, but all agree that the Model 617 will last a lifetime, and hold its value. 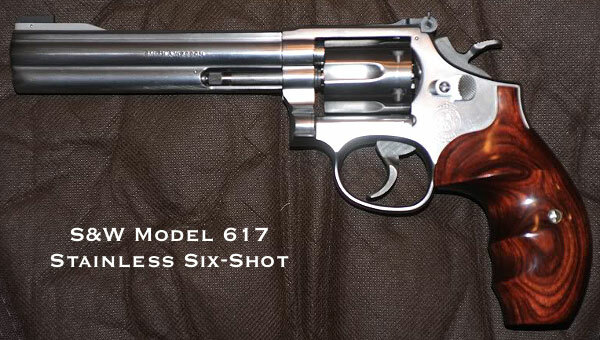 22 Plinkster loves the Model 617, “one of his favorite revolvers in the whole entire world — a great choice”. He reports it “shoots straight [and] functions pretty much flawlessly” with nearly any .22 LR ammo. In this video, 22 Plinkster tests a wide variety of rimfire ammo types including CCI .22 LR Std Velocity, .22 Shorts, .22 LR Shotshells, .22 Stingers, .22 Super Colibri, and .22 LR tracers. If you’re considering a rimfire revolver but would like to see other options, read our Buyers Guide to Rimfire Revolvers. 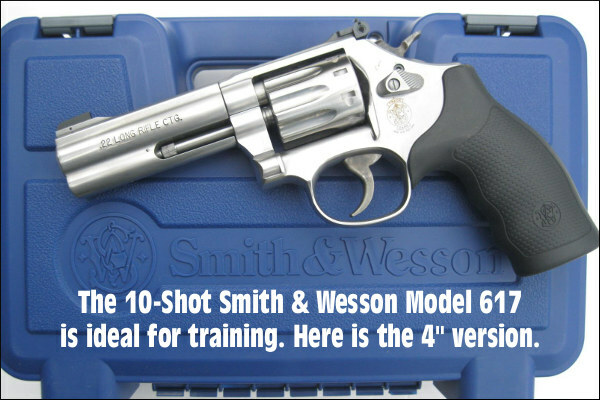 Along with the S&W Model 617, this covers the Ruger GP100 10-shot (5″ bbl), Ruger LCRx 8-shot (3″ bbl), Classic S&W Model 17 6-shot (blued 6″ bbl), and S&W Model 63 (3″ bbl). 1. Rimfire .22 LR Ammunition is once again plentiful and affordable. The revolver can shoot all kinds of rimfire ammo — even 22 Shorts. 2. A good, full-size .22 LR revolver will be MORE ACCURATE than the vast majority of semi-auto rimfire handguns. It will shoot all types of .22 rimfire ammo with no cycling issues. With no magazines to jam, a good wheelgun will also be more reliable than most self-loading rimfires. 3. A rimfire revolver can shoot tens of thousands of rounds, with just routine maintenance. The gun can last a lifetime and then be passed on to your kids. 5. It is easy to change grips and sights to suit your preference. You can also easily mount a scope on the top-strap. The .22 LR cartridge makes small bullet holes in paper. 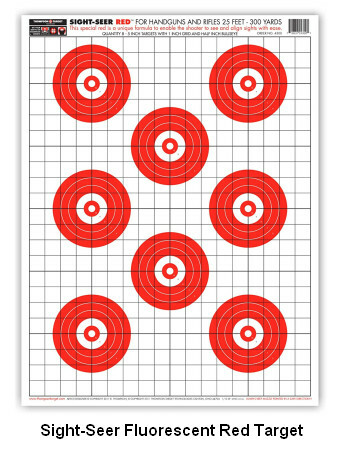 These can be hard to see if you’re shooting at large, black bulls-eyes, particularly at an indoor range. Also, when shooting rimfire, you’ll go through ammo quickly. For that reason we recommend targets with bright-colored, multiple aiming points. 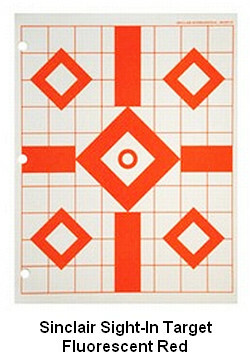 The 19″x25″ Sight-Seer target (left) is great for pistol practice. It features eight red bulls on a 1″-square grid. Ultra bright fluorescent red inks, printed on heavy, 60-lb vellum paper, are highly visible, even indoors. You can use a classic Six O’Clock hold with this target, putting the bottom of each circle on top of your revolver’s front sight. The smaller, 8.5″x11″ Sinclair Fluorescent Sight-In Target (right) also works well. It has four small diamonds surrounding a large center diamond overlaid on a 1-inch grid. Diamonds and grid are printed in fluorescent red/orange on white, heavy-grade paper so your shots print nice and clean. 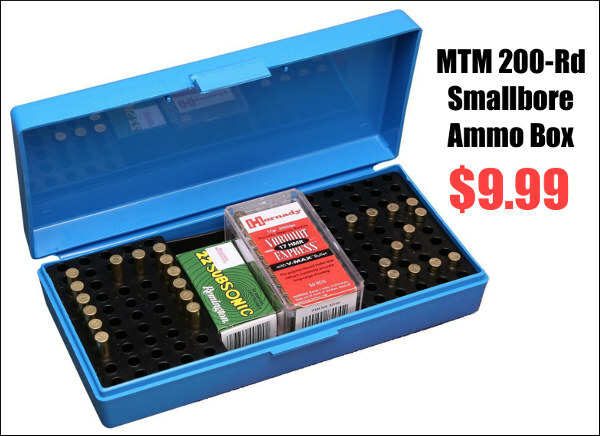 When we go to the range with rimfire handguns or rifles we bring this handy $9.99 MTM ammo caddy. The compact carry case will hold boxed ammo, plus you can lay out your ammo in 10-round rows. This makes it easy to fill the 10-Rd cylinder on your Model 617. This ammo case is offered in both blue (as shown), or red. Share the post "Wheelgun Fever — Why Our Favorite Handgun is Not a Glock…"
1. Purchase of Firearm by Parent for Child. Q: May a parent or guardian purchase firearms or ammunition as a gift for a juvenile (under 18 years of age)? 2. May an FFL Transfer a Firearm by Way of a “House Call”? Q: I have an elderly customer who cannot leave his home. I have a gun in my store that he wants to buy. Can I go to his house, have the Form 4473 completed, call for a background check and deliver the gun to him, providing that all the background checks clear? A: Federal Firearms Licensees (FFLs) are required to conduct business from their licensed “business premises.” The Form 4473, Part 1, is for an over-the-counter transaction. The buyer must appear in person at the FFL premises. Licensees may not conduct firearms transactions from locations other than their licensed premises, with the exception of gun shows or other events dedicated to the sporting use of firearms and held in the state where the FFL’s premises is located. An FFL who locates purchasers by other means must complete the transaction and all required paperwork at the business premises indicated on the FFL’s license. 3. Can the Spouse of a Transferee (Buyer) Pick Up a Firearm? Q: A customer filled out a Form 4473 on a shotgun. The NICS background check reply was delayed, but the following day NICS approved the purchase. The customer could not get back to my store during open hours, however, so he sent his wife to pick it up. May I transfer the shotgun to her? A: The shotgun may not be transferred to the customer’s wife, as she is not the intended transferee. The customer must return to the store himself and complete the ATF Form 4473 to receive the firearm. He must recertify that his answers in section A are still true, correct and complete by signing and dating Section C on the ATF Form 4473. 4. What Is the Procedure for an Older Firearm with No Serial Number? Q: I have received a firearm on trade. It was made before 1968 and has no serial number. I must note the physical markings on the firearm in my records. What do I do in this case? A: Unfortunately, marking requirements that existed before 1968 did not apply to all firearms. Many of the firearms manufactured and imported prior to 1968 bear no serial numbers or other markings. Licensees who receive these firearms should note in each descriptive column in the acquisition record the physical markings that appear on the firearms. If no serial number was placed on the firearm, it should be specifically noted that “Firearm has no serial number” or recorded “NSN.” Remember, however, it is illegal to remove or alter a firearm’s serial number, and a licensee should report such a firearm to the nearest ATF office. Refer to the ATF P 3317.2, Safety and Security Information for Federal Firearms Licensees. 5. What Should Be Done if an FFL Finds a Firearm That Was Previously Reported Lost? Q: I’ve reported a lost firearm. I’ve done all the necessary paperwork and notifications. Now, I’ve found the firearm. What is my course of action? A: FFLs who report a firearm as missing and later discover its whereabouts should advise the ATF, as well as their local law enforcement agency, that the firearms have been located. The ATF can be contacted at 888-930-9275. In addition, once the firearms are located, they must be re-entered into the Acquisition and Disposition (A&D) record as an acquisition entry. 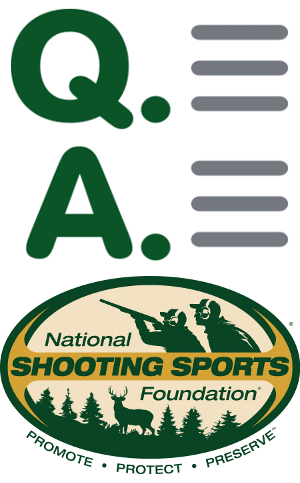 Share the post "NSSF Answers Tough Firearms Transfer Questions"